This was truly not only a chapter installation meeting with a difference, but one of the most exciting developments in Royal Arch Masonry in our Province. It is well worth re-telling the story of the development of this unique Convocation. Ian Cuerden, not in his familiar installation pose! It all started about 18 months ago with conversations between Stanley Oldfield (who, as no doubt you are well aware, is a Past Third Principal of the Province), and Andy Baxendale, a stalwart of the Widow’s Sons Masonic Bikers’ Association, with others, who were all keen to form a Royal Arch chapter that would attract like-minded companions and brethren with a shared interest in motorbikes. Andy is the President of the North-West Chapter (not the Royal Arch type!) of the association, and his fellow members all sport their leathers and official Widow’s Sons jackets and patches. Widow’s Sons was originally chartered in the USA in 1998, and now has 150 chapters across the USA and Canada, all being Masons, all being motorcyclists, and all enjoying their hobby and friendships to raise money for charity. In the UK, there are now 14 chapters, and are recognised by UGLE. It was about this time that due to falling numbers Skelmersdale Waterloo Chapter No 1380 found itself facing the prospect of handing back its charter and ceasing to exist. The active membership had fallen to single figures and it was proposed to close the chapter in January 2017. The members agreed to keep the chapter alive in order for it to change direction. The opportunity was seized to save this historic chapter (consecrated in 1926) and to embark on an exciting journey to find the bikers a Royal Arch home. Complex negotiations followed, and with help from Province, a myriad of logistical difficulties overcome, and the necessary changes to bylaws etc. made, the chapter was allowed to move to Ashton-in-Makerfield and meet in its own peculiar fashion. Proceedings commenced at 9am on Saturday morning with a hearty breakfast, as there was to be no formal festive board after the meeting. The car park was full of motorcycles. Following breakfast, the installation commenced at 10:30 Many of the companions wore their regalia over motorcycle leathers. The chapter was opened by the three principals, Chris Williams, Tony Simms and David Ogden, and the initial business conducted. This included a ballot for seven joining members, who were admitted, and a further successful ballot for four candidates for exaltation. It was then time to receive the principal guest, Assistant to the Provincial Grand Principals Ian Cuerden, himself a great advocate and supporter of the revised chapter, accompanied by group chairman Geoffrey Porter and acting officers Chris Reeman and Peter Ledder. All received a warm welcome into the chapter. The chapter then stood with respect to departed merit in remembrance of a Blood Bike volunteer recently sadly killed in an accident whilst on duty in the Province. Pictured from left to right, are: Geoff Gill, Bill Bruce, Ian Cuerden and Greg Casson. The three principals then went ahead to install their successors, Greg Casson as third, Geoffrey Gill as second, and Bill Bruce as first, all sporting their Widow’s Sons dress, as were Paul Brunskill, Andy Baxendale and Ian Wilson, who delivered the robe addresses. It was a delightful and dignified ceremony, led by DC Joe Williams. It was then time to invest the officers, all junior companions on the chapter floor, again, sporting their regalia over their motorcycle ‘best dress’. The ceremony concluded, it was time for Ian Cuerden to bring the greetings from the Grand Superintendent, who, he said would have been delighted with the ceremony, and with one of the most exciting moves within the Province. He congratulated all who had taken part, wished the new principals and officers the best of health to enjoy the chapter progressing from strength to strength, as he was sure that it was. Above all, he urged everyone, using some well-known words from the exaltation, to keep safe on their motorcycles, enjoy their Royal Arch Masonry and their biking. Bill Bruce responded and thanked Ian for his presence, his kind words, and was pleased to present three £100 charitable donations in favour of Ashton Masonic Properties, Friends of Tithebarn, and Friends of Eccleshome. Ian Cuerden addressed, and then Bill Bruce presented, Supreme Grand Chapter certificates to Brian Jaffray and Lee Walters. Following the convocation, the bikers set off for a ride-out to the Anderton Boat Lift in Cheshire. The chapter meets on the third Saturdays in May and September each year, starting with a breakfast at Ashton-in-Makerfield Masonic Hall with the installation in May and exaltations at the September meeting. 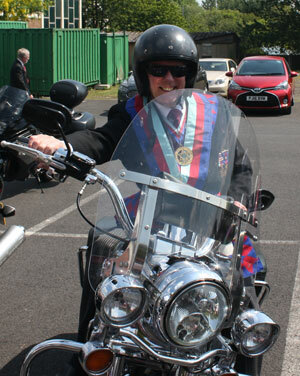 There is no festive board after the meeting, the usual procedure being an organised bike ride in the afternoon. Bikers may wear their leathers etc, but must have a shirt with a white collar and Masonic tie. Membership is open to anyone especially those interested in motorcycling. 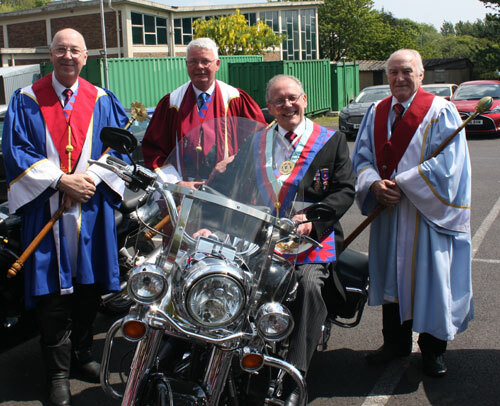 Many of the members belong to the Widow’s Sons Masonic Bikers’ Chapter which has an extensive programme of activities. If anyone is interested in joining this Royal Arch Chapter full information can be obtained from Barry Dickinson, secretary, (e-mail barry.dickinson@gmail.com). who will be happy to provide any information to enquirers. Chapter members after the convocation.